A QUIEN NO LE GUSTA EL CHOCOLATE? 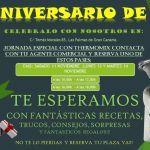 CON SUS GRANDES BENEFICIOS Y PROPIEDADES,ENERGICO,ESTIMULANTE,PLACENTERO. RICO EN GRASAS MONOINSATURADAS Y SATURADAS,FIBRA,MAGNESIO Y FLAVONOIDES MUY ANTIOXIDANTES. 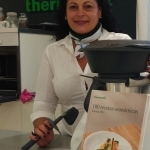 MEJORA LA HIPERTENCION Y LOS NIVELES DE COLESTEROL, ADEMAS MEJORA LA SALUD DEL CORAZON, Y Thermomix® LO SABE,ES POR ELLO QUE HA SACADO ESTA NUEVA EDICION,PORQUE EL CHOCOLATE,ADEMAS DE SER UN DULCE,TAMBIEN ES UN ALIMENTO. ADEMAS DEL Thermomix® CON EL COO-KEY(CON EL CUAL PODRAS TENER TODAS TUS RECETAS DE LA PLATAFORMA COOKIDOO DE MODO GUIADO)TENDRAS EL LIBRO DE CHOCOLATE CON MAS DE 200 RECETAS,EL CODIGO DE CANGEO PARA LA PLATAFORMA,UN SEGUNDO VASO COMPLETO UN SET DE ACCESORIOS PARA TRABAJAR EL CHOCOLATE,Y POR SI ESTO FUERA POCO AL 0% DE FINANCIACION. A QUE ESPERAS PARA TENER LA TUYA? DEJA TUS DATOS Y ME PONDRE EN CONTACTO CONTIGO.